Abstract: This is an attempt to piece together the literary evidence for late fourteenth-century military equipment and balance it with a thorough examination of historical or archaeological examples; especially given Chaucer’s description of the Knight in Canterbury Tales and the Arming Process in the Tales of Sir Thopas in ‘Sir Gawain’. Consequently, this essay tries to place Chaucer’s Knight and Sir Thopas in their proper military historical context. Introduction: This essay attempts to re-appraise selected passages of Chaucer’s Canterbury Tales and Sir Gawain and the Green Knight from a wider military historical and archaeological perspective. In particular, my aim is to discuss the military context of arms and armour in the portrait of the Knight in the General Prologue, the tournament in the Knight’s Tale and the arming scenes in the Tale of Sir Thopas and Sir Gawain and the Green Knight. One of the most pressing dilemmas for any such assessment of the literary sources is the problematic, and occasionally multiple, meanings of words and nomenclature. Today, such issues have been greatly standardised, but we should remember that when Chaucer uses, for example, the term spere he is not necessarily referring to the short-shafted weapon we recognise today but, more often, to the long-shafted lance favoured by the knightly classes. Equally, popular misconceptions abound regarding medieval arms and armour. When discussing medieval military terms we are potentially faced with an alarming quagmire. While many words and phrases may still appear to make sense to a twenty-ﬁrst century reader, such as ‘harness’, the original meaning may be contorted or changed altogether. Worse still, there is a bewildering array of archaic terms and technical designations for speciﬁc armour parts, all of which must be readily understood. As Thomas Abler noted, it is wise to ‘… consider some of the limitations of the data and literature relevant to or describing military uniforms of the past.’ For this reason, each military word and term must be, like the original knight at tourney, weighed, balanced and found not to be wanting. In 1995, Michael Prestwich noted that warfare ‘… was more important to medieval knights than to many of their historians.’ This point has sub-sequently been tackled by both historians and archaeologists. One obvious contribution to the culture of warfare comes through an analysis of its contemporary literature. is point has been made valuably before, when Stephen Herben wrote that such an investigation of arms and armour in Chaucer would ‘… conﬁrm impressions of his realism and establish more ﬁrmly his existing claims as a dependable source for manners and customs in the fourteenth century.’ However, one also has to be alert to the potential dangers posed here. We must be careful to recognise the difference between using military history to understand the observational writings of Chaucer (and his contemporaries) and the appropriate juncture at which to use these to corroborate or add to our knowledge. For example, we are told that Sir Gawain’s mail-coat has been ‘rokked of þe roust’, a necessary everyday process in which the coat was rolled or rubbed to keep it burnished and clean, but not exactly the most glamorous of tasks. As such, a reference to this process is highly illuminating and all the more convincing. Indeed, one could be forgiven for thinking that, once one has solved the issue of what such characters were wearing, the veracity of the material will speak for itself. Yet, this is only part of this essay’s intention. In order to put these important texts into their military historical context, one must also analyse the practical use of such weapons and their effects. 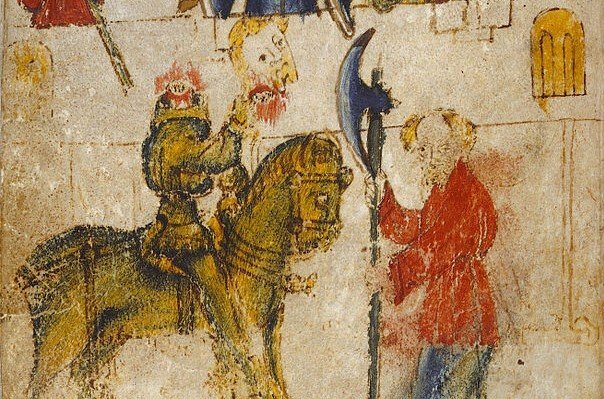 Accordingly, I hope to emphasise that the characters of Chaucer’s Knight, Sir Thopas and Sir Gawain are in their different ways representative of the most identiﬁable class in medieval society – the knight at war.